I’m new to sailing. How do I get started? We offer a three (3) day beginners course (Basic Keelboat 101) that will prepare you to be a skipper of a 22 to 25 foot sail boat on lakes and bays. We also offer a two (2) day Basic Keelboat 101 course for folks that have “some” recent sailing experience. For quality control, all of our sailing courses are certified by the American Sailing Association. Will I be stuck in a classroom all day? More than 80% of your instruction will be on the water with less than 20% in the classroom. We believe that hands on instruction is the best way to learn the sport of sailing. You will be onboard and sailing the very first day. What are the hours of instruction for the Basic Keelboat 101 course? Our Basic Keelboat course hours are typically from 9am until 5pm. How do I know that Lanier Sailing Academy is a quality organization? 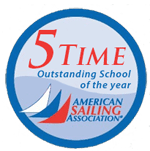 We have received The Outstanding School of the Year Award from The American Sailing Association five times. This award is given to the top 25 schools out of 300 worldwide each year. Also, our instructors have received the Outstanding Instructor of the Year Award from The American Sailing Association nine times (Top 30 instructors out of 2,500 worldwide). These awards were earned by Lanier Sailing Academy and our instructors via confidential surveys from our customers directly to The American Sailing Association. How long has Lanier Sailing Academy been in business? We’ve been teaching the art of sailing since 1969 and are the oldest continually operated sailing school in the South. How much does the beginner's course cost? Our three (3) day Basic Keelboat (BKB-101) course fee on Lake Lanier is $585; on Pensacola Bay is $595. Our two (2) day Basic Keelboat (BKB-101) course fee on Lake Lanier is $485; on Pensacola Bay is $495. Our price includes your Sailing Made Easy book, a Coast Guard Safety pamphlet, an ASA (American Sailing Association) log book, Access to an online e-course, on the water instruction, classroom instruction, ASA testing fee, and ASA certification fee. No additional charges will be requested. What if I struggle with the Basic Keelboat course and need more training than the three days allocated? Lanier Sailing Academy is proud to be the only sailing school in the South that offers a guaranteed certification. Most students can complete/pass our Basic Keelboat course within three (3) days. In the event you need more instruction (on the water or classroom) we will bring you back for more training at no additional cost until you pass. Additional training must be scheduled for weekday usage. Guarantee is good for our three day BKB-101 course only. I’ve heard that some sailing schools are attempting to teach as many as six students onboard the boat at a time. Do you have a maximum student teacher ratio for your on the water sessions ? Yes, we have a maximum of three (3) students per boat, per instructor for our Basic Keelboat 101 adult courses. Is there a pre-course reading assignment? Yes, we ask that you read our Sailing Made Easy text book prior to your first day of training. This course book is an interesting and interactive read that typically takes about three hours. Your pre-course reading assignment and viewing the online e-course reduces your required classroom time and allows you to spend over sixteen (16) hours of sailing fun onboard our boats. What type of sail boats are used for the Basic Keelboat course? All of our locations use Capri 22’s made by Catalina. These nimble boats have a heavy lead keel that allows for a stable instructional platform while also providing plenty of seating room for our students. What if Lanier Sailing Academy’s scheduled Basic Keelboat course dates will not work with my family & business calendar? We do offer a Private Lesson Option for our Basic Keelboat course. You tell us when you can sail. Just give us a call to schedule and obtain a quote. 800-684-WIND (9463). What do I need to wear/bring for my on the water adventure? We suggest you dress in layers. The mornings can be a little chilly and our afternoons can be a bit warm. Please bring foul weather gear (rain coat with pants) deck shoes or white sole sneakers, sunglasses, a hat, sunscreen, a box lunch and a smile. Just give us a call at 1-800-684-WIND (9463) or (770) 945-8810 or you can register online at www.laniersail.com. On the phone we can complete your registration in just two minutes. Course materials will arrive in your mailbox within one week via USPS Priority Mail. After completing the Basic Keelboat course can I come back and use the school’s boats to practice? Yes, we encourage you to come back to the dock as soon as you can. We believe practice makes perfect. You can come back and rent our boats or for frequent boaters you can join one of our Sailing Clubs. Our clubs are the best way to hone your skills through free clinics and regattas. Do I need to buy a boat to continue to sail? Of course not. Each of our facilities has an associated Sailing Club to help our students continue their education and hone your new found sailing addiction. We provide the boats, dockage, fuel, maintenance, insurance and dock instruction. You provide your friends and family as crew. How much does it cost to join one of Lanier Sailing Academy’s Clubs? You get unlimited sailing for the same rate, whether you sail once a month or once a week or once a day. Each club location has its own unique rate due to the size of boats in each fleet, local cruising grounds and various services offered. Please feel free to give us a call so we can provide a quote on the sailing club nearest to you 1-800-684-WIND (9463). I have this dream of owning a boat. How can the Sailing Club help with my dream? Our sailing clubs allow you to skipper several different types of boats with the goal of understanding your likes and dislikes of each boat. Our dock instructors can also assist you with understanding the boating market place and numerous manufacturers and their various equipment and designs. We believe a more informed boat buyer is a happier boat owner. Join one of our clubs for a year and become an informed boat user/buyer. How can I continue to learn more about sailing? Our Sailing Clubs offer free clinics to our members. We provide continuing education via many types of clinics: docking, spinnaker, racing, anchoring , BKB review, coastal navigation, heavy weather sailing, celestial navigation, etc, etc, etc. We do offer something other than education through various fun events such as: club regattas, dock parties/cookouts, captained full moon night sails, etc. Each of our club locations has created a unique and custom approach to fun sailing events. Please feel free to call the Lanier Sailing Academy facility closes to you for more sailing club details.